Morning.. Happy Bank Holiday to those in the UK.... I'm looking forward to a very short work week as I am also off on Friday this week. I'm hoping the weather today isn't too bad and I can get outside this afternoon after the gym this morning. I really need to get out on my bike if I'm going to manage the Manchester to Blackpool cycle in a few weeks. I have a LOTV card for you today using another one of the New Beginnings release from April. 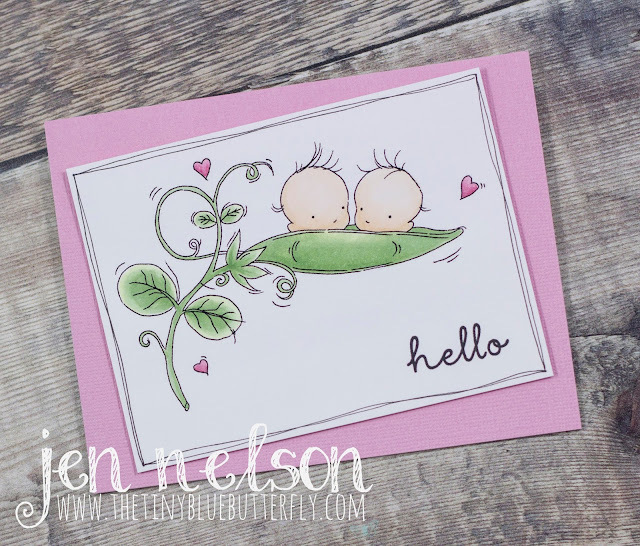 I used the Peas in a Pod stamp and printed it off so it filled most of the card front. The image is coloured in with copic markers and then the panel has been trimmed. I added a sentiment from Hero Arts and then added a doodle border to the white panel before mounting it on some light pink co-ordinations card stock at an angle. A bit of wink of stella on the hearts finishes off the card. The view at this place was amazing. This event was in the evening so it’s really a site to see when the sun sets. Just beautiful wedding venues Los Angeles! If you are planning your wedding here, don't worry too much about how to make it look even more beautiful.